For the past four years, the fabric of my college experience has been interwoven with the momentum of the Good 5 Cent Cigar. Every semester when I built my schedule I knew I needed my classes to end on Wednesday before 6 p.m. so I could be in the office for production, and I needed to keep Tuesday and Thursday nights open for deadlines and meetings. I set aside time each week to write my stories instead of getting a real job and I gave up enjoying campus events as an attendee because I was covering them. I never stopped looking for story ideas, and I diligently questioned most everything about the University of Rhode Island. Throughout my tenure at URI, I never took off my reporter hat. And maybe I never will, but officially, this is my last issue as the Editor-in-Chief of the Cigar. It’ll be strange, slipping into the new normal that doesn’t revolve around URI’s various happenings and angry letters to the editor, but it’s the first step of many in finding my own momentum as an adult. This past semester has been the Cigar’s most dramatic and tumultuous one yet. I’ve never seen so many people walking around with copies of the paper, nor have I ever seen this many people react so publicly and strongly to what we’ve published. I also think that in journalism, when people are constantly criticizing you (or threatening to sue you, or hiding your newspapers or saying they want to start their own newspaper), you might just be doing something right. Almost every issue we ran this semester had something to do with sexual assault within it’s pages. 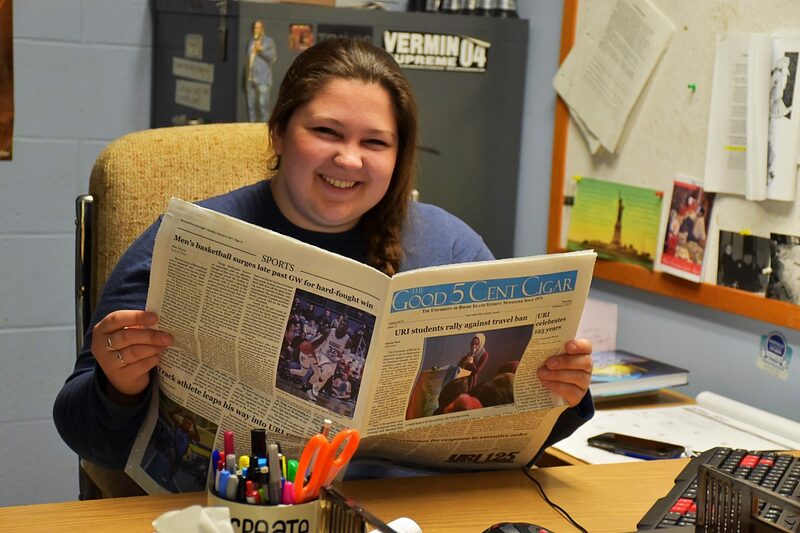 From Kelsey Santmyer’s column in September to Julia Moro’s column last week, we’ve covered rallies, printed university responses, ran letters to the editor and investigated countless leads. I didn’t plan for the course of the Cigar this semester, we just followed the news. In a world where there’s a new sexual assault claim every week, it’s not surprising that this issue has made front page headlines on our own campus. Yes, front page headlines, because stories highlighting sexual assault demand our continued attention if we ever want to prevent sexual violence on this campus. I didn’t choose to run Santmyer or Moro’s columns on the cover to undermine Greek Life’s philanthropic accomplishments or to dissuade people from being a part of Greek Life. I chose to run them on the cover because it’s about getting people’s attention and starting a conversation. It’s about creating momentum to hold the institutions within our University accountable, and making sure that they uphold their promises to foster a safe learning environment for all students. As I wrote a few weeks ago, we’re just the platform. It comes down to you–faculty, staff, students, community members, administrators–to carry on the momentum to create real change. We can’t stop talking about sexual assault. Rather, we should be unapologetically vocal about supporting and believing survivors, educating people about prevention and strengthening policies surrounding how this university handles sexual assault. URI should always be looking to see how well sexual assault policies work for its students, and it’s better to show that you’re working on fixing the problem than pretending everything is fine. Because if I’ve learned anything over the past few weeks, it’s that everything is not fine, and URI needs to do better to serve its student sexual assault survivors. Next week I’m handing the Cigar over to my staff’s capable hands, and even though my life won’t revolve around the Cigar next semester, I still plan to contribute and work on stories I didn’t have time to pursue. I couldn’t give up journalism that easily if I tried–perhaps the momentum is a little harder to break than I expected. A student’s college experience shouldn’t be intertwined with the momentum that comes with a sexual assault. But unfortunately, that’s the reality that one in five women and one in 18 men in college face. My job as a reporter is to tell their stories and give you the facts, and I will. But your job is to do something about it.